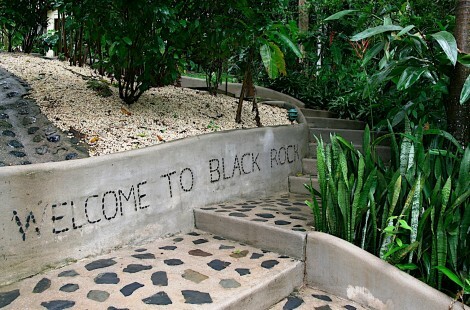 Black Rock Lodge "Our Belize Vacation" - "Our Belize Vacation"
Black Rock Lodge's passionate commitment to environmental stewardship and sustainable operation is evident in every aspect of your stay with us. The electricity for our beautifully situated, riverfront cabins is supplied by a custom hybrid system consisting of micro-hydro and solar power and we practice energy conservation throughout the Lodge. 100% of our water use is supplied by a nearby mountain spring and the Lodge is able to reduce water use through the installation of water conserving appliances. In addition, the wastewater from our staff quarters is processed through a "constructed wetland" which uses plants and aerobic activity to more completely clean the water. 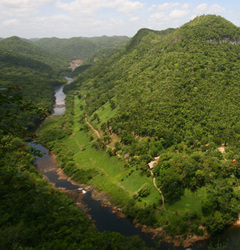 Our knowledgeable and helpful staff come from the surrounding communities of San Ignacio, Bullet Tree, and Santa Elena. We complement our delicious restaurant fare with fresh, organic fruits grown on site and use the compost from our restaurant to fertilize the garden. 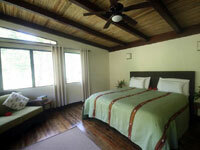 The Waterfall Deluxe with king bed is designed to be the ultimate haven in the middle of the rainforest. 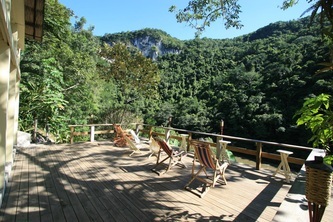 With a delightful walk-in shower viewing the canyon cliffs and a private deck overlooking the Black Rock Falls, the cabin provides stunning views along with comfort, privacy, and thoughtful design details. The spacious interior has a hardwood writing desk, pleasant seating arrangement, and simple decoration provided by local artisans. 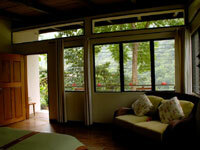 The bathroom has mahogany woodwork and limestone flooring. 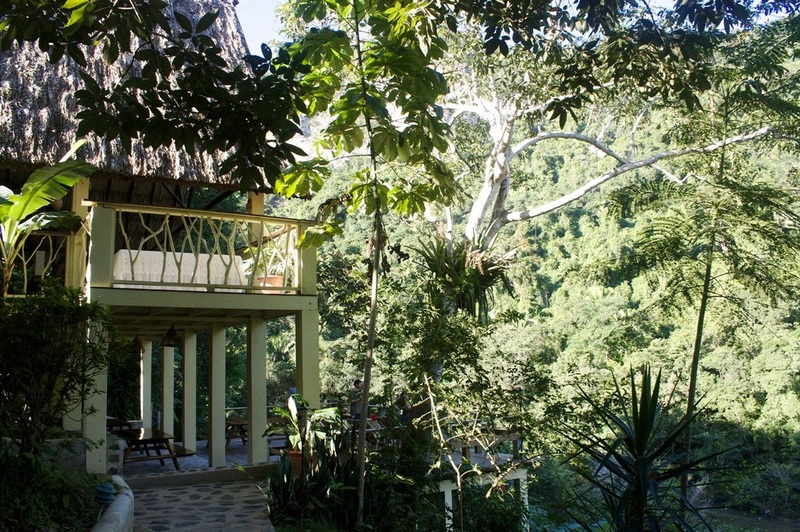 This cabin is the perfect retreat for couples on their honeymoon. Recently renovated, the Waterfall Deluxe with two queen beds offers a private outdoor deck with stunning views of the canyon cliffs and Black Rock Falls. The spacious interior has a hardwood writing desk, pleasant seating arrangement, and simple decoration provided by local artisans. 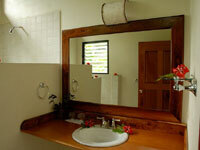 The bathroom has mahogany woodwork and limestone flooring. 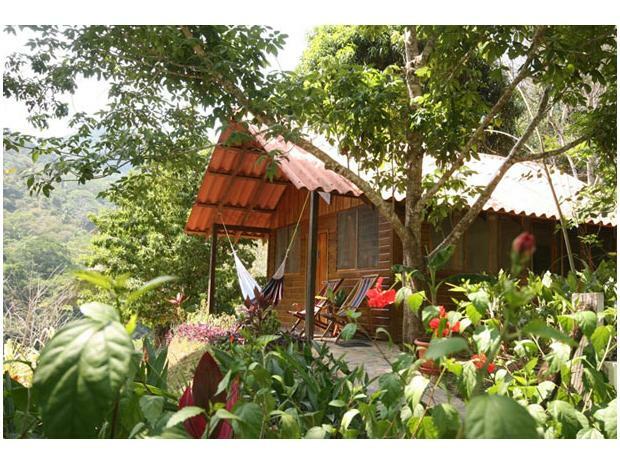 With privacy, comfort and relaxation in mind, this cabin is the perfect retreat for couples or families who desire a luxurious rainforest experience. 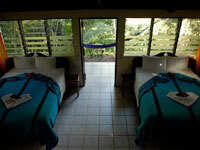 The Deluxe cabins, with 2 queen beds, are spacious, comfortable, private, and built to take advantage of the fresh mountain breezes with ample windows and high pitched rooflines. 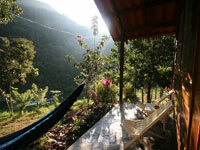 Panoramic views of the Macal River and Canyon are visible from their exterior patios and hammocks. 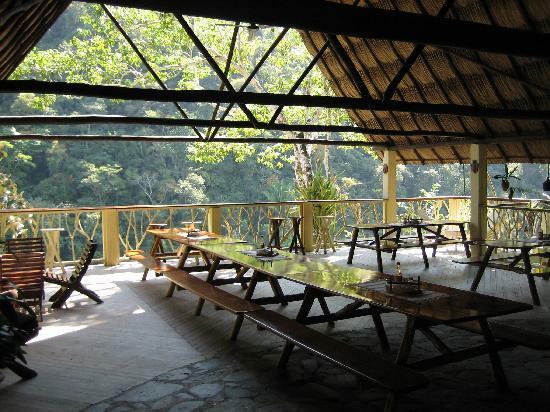 The interiors offer a hardwood writing desk, pleasant seating arrangement, and simple decoration provided by local artisans. 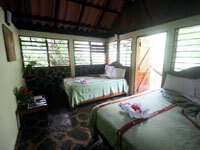 The bathrooms include beautiful mahogany woodwork. 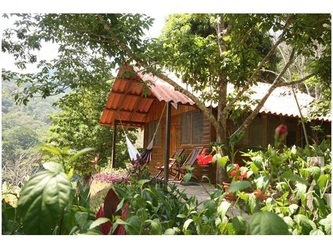 This cabin is ideal for couples, families, or friends traveling together. Recently renovated, the River View Cabin with king bed is comfortable and private – built with the same thoughtful design as the Deluxe cabins: ample windows and high pitched roofline. 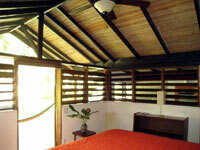 This cabin is slightly smaller than the Deluxe cabins and is simply decorated with local artwork. 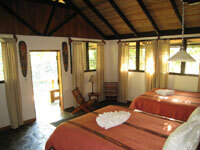 The ensuite bathroom offers limestone flooring and cedar woodwork. 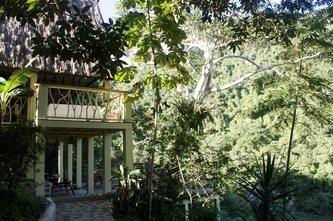 With excellent views of the Canyon and Macal River from the exterior patio and hammock, this cabin is wonderful for couples. 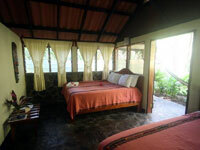 The River View Cabins, with one queen bed and one double bed, are comfortable and private, built with the same thoughtful design as the Deluxe cabins: ample windows and high pitched rooflines. 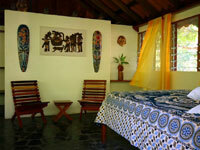 They are slightly smaller than the Deluxe cabins, have ensuite bathrooms, and are simply decorated with local artwork. 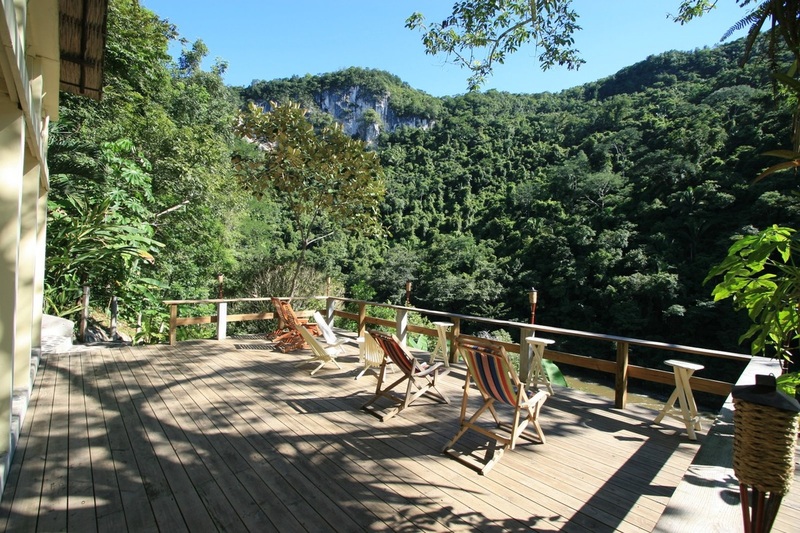 With excellent views of the Canyon and Macal River from the exterior patio and hammock, these cabins are a delightful home-away-from-home for couples and families visiting Black Rock. 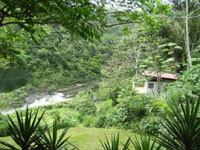 The Cliff View Cabin is identical to the River View Cabins, however it is located 15 yards further up the riverbank. 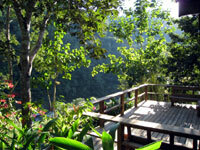 It has exquisite views of the Canyon Cliffs, a private bath, exterior patio, and one queen and one double bed.